The 2015 Summer Music Performance Program at Anatolia College took place from July 2 to July 12, 2015. The distinguished faculty consisted of: Dwight Coleman (voice - opera), Thomas Robertello (flute), Nevart- Veron Galileas (flute - flute ensemble), Christos Galileas (violin), Maria Luisa Ryan (harp), Jura Margulis (piano), Alex Peh (piano) and Yiorgos Vassilandonakis (composition). There were daily lessons, masterclasses, lectures on musicological subjects, a concerto competition, a solo recital of pianist Jura Margulis, a faculty concert, an opera production and a student concert. We are pleased to note that the performances by our distinguished artist faculty were enthusiastically received by our audience, and a fantastic violinist Emilia Gasparian, emerged from a field of seven competitors to win the Anatolia College Concerto Competition. 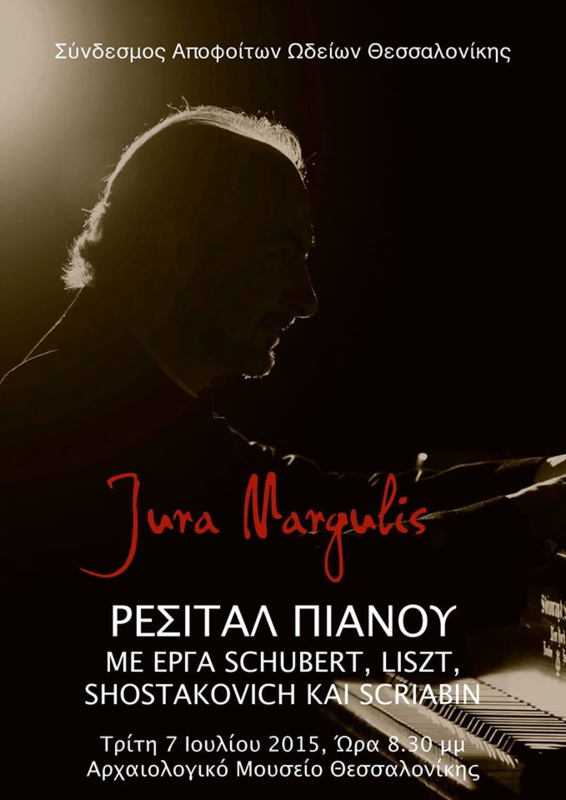 On July 7th, Jura Margulis kicked off the series of performances with a stunning virtuoso solo piano concert for a sold-out crowd at the Archaeological Museum of Thessaloniki. Mr. Margulis arranged new solo piano versions of Schubert’s Marche Militaire, Liszt’s Soire de Viennes, and Shostakovich’s Eighth symphony. The audience was treated to a thrilling evening of virtuosic pianism of the highest level. “I have never heard such a virtuosic display as that!” said piano student, Danielle Strassman." On July 8th, the distinguished faculty from schools such as Indiana University, Georgia State University and State University of New York in New Paltz collaborated to perform a diverse program of traditional classics, virtuoso transcriptions and contemporary music. “It was such a lovely mix of styles and genres. All at such a high level.” said Sarah Hitchcock. On July 9th, Dwight Coleman and Alex Peh led a group of Greek singers to perform fully staged scenes from Mozart’s Marriage of Figaro. Popular arias such as “Porgi Amor” and “Dove Sono” were featured in an hour-long performance of this timeless classic. The capstone event of the program was a concerto competition on July 9th, open to all of the participants of the program. The competitors came from New York City, Chicago, and Bloomington as well as from Thessaloniki, Greece. The winner was Emilia Gasparian, a thirteen-year-old Greek-Armenian violinist from Thessaloniki, playing the celebrated Violin Concerto in E minor by Felix Mendelssohn. She will be featured in a concert with the City Orchestra of Thessaloniki in the upcoming 2015-2016 season. On July 10th, An international roster of students performed music together at Raphael Hall to cap off a busy week of performances, lectures and masterclasses by the distinguished artist faculty. On July 11th, The program concluded at the Sani Beach Resort where students enjoyed a beautiful day at the beach, an elaborate lunch buffet and an impressive jazz concert in the evening. “I learned in one week what I would learn in an entire semester!” said Connor Milton, student composer from New York.